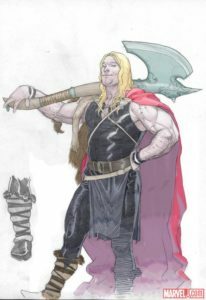 Amazingly enough, it only now occurs to me that they might be Aaron’s new iteration of the Warriors Three. 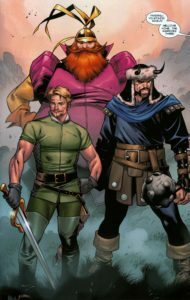 The Warriors Three being Fandral the Dashing, Hogun the Grim, and Volstagg the Valiant. The Goddesses of Thunder are actually the granddaughters of King Thor, the future version of Thor. They are Frigg the Fierce, Ellisiv the Astute, and Atli the Slightly Mad. Those are not their official titles, just something I made up. 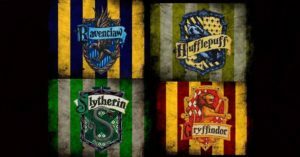 I could just as easily called them Frigg the Gryffindor, Ellisiv the Ravenclaw, and Atli the Slytherin. 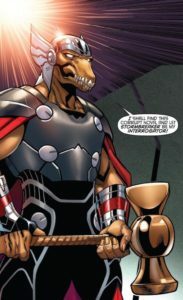 Cause of Destruction: Not only has Beta Ray Bill’s prized weapon kept on keeping on, but it has done it for millenia! Cause of Destruction: Still bashing heads thousands of years later. Cause of Destruction: Nothing can seem to break or destroy this axe. Well, we have reached the end of this week’s blog, and I must confess that I could not stop writing it once I started. The Goddesses of Thunder are just too much fun to hang out with. Also, here’s a bonus, Atli has a chance to fight some dragons after all! 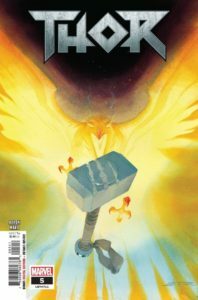 See you next week as I shake things up and write about the comic book Asgardians of the Galaxy. The universe is getting bigger, and full of more weapons I can geek out over! 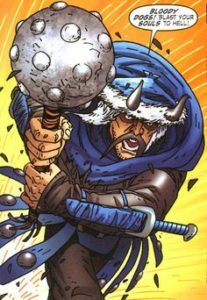 *NOTE: I made up the name for Hogun/Ellisiv’s mace. I tried to piece together the Norwegian words for “Quiet Wolf.” Hope it sounds good to you all!